The Premier FIFA 13 Guide has some seriously great tips for both drawing the penalty foul and actually scoring the penalty, along with 120 pages of other, great content. If you're interested, check out my full review before you make a decision! 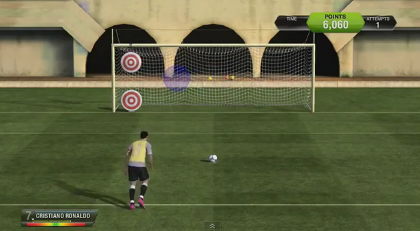 FIFA 13 offers a variety of practice methods to help you perfect your penalty-taking skills. The 1v1 practice arena offers the most direct method as you can simply enter the penalty area and press left on the D-pad to initialize a practice penalty. The Practice Mode allows you to do a lot of penalties one after the other against a keeper. Finally, the Penalties Skill Games allow you to practice your penalties in a variety of ways and actually see how your "scope" moves as you aim. For reference, the picture above shows this scope, the moving blue circle.